Tony (teenix) has already presented his "Multi Calculator" in another thread. I really like his project, but I also like having real calculator hardware. So I have designed a PCB that replaces the main PCB of a Classic calculator but retains the keyboard and display PCB. This is a 1:1 replacement and does not require any modification to the calculator, which means it is fully reversable. The PCB has a mini USB connector for communication and update from the PC. 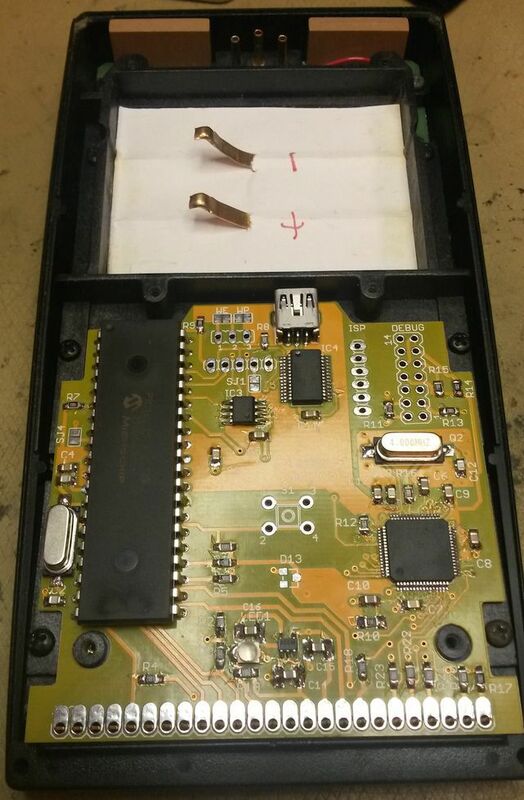 You can optionally cut a whole into the battery compartment to access this connector by simply removing the battery pack rather than opening the calculator. It will have all the same features as Tonys original, but will use the Classic display and keyboard hatdware. Tony has very kindly put a lot of effort in to make his software compatible with my hardware. There are a few problems to solve yet, but I expect that will be done guite soon. The price will be €80 plus shipping (I would expect that to be arround 8 Euros world wide and insured. The chunk of that is component cost, with a small fee for testing and assembly and another small amount that will go to Tony to compensate him for his time and effort on the software. Let's take this one too. Count me in for 2. Fantastic new life for old technology. I'm in, I'll take one please. Which classic models will this work in? Even if the answer is all of them, it's probably best to list them, just to be certain. For example, the battery bay and case design is different between the 65/67 and the 35/45/55/70/80, so will the board fit both styles? (10-27-2017 01:09 PM)rprosperi Wrote: I'm in, I'll take one please. Good point! It fits the 35, 45, 70 and 80. The 55 has more pins on the keyboard pcb, the 65 a smaller main PCB and the 67 technically isn't even a Classic. Boards for the 55 and 65 could be made, but I doubt there is much of a market for those. To me the cheap volume models such as 45 and 80 are the most likely candidates for an upgrade. I have a dead 65 wich is in good shape. So I would need one for a 65. (10-27-2017 09:09 PM)Hans-Peter Wrote: I have a dead 65 wich is in good shape. So I would need one for a 65. I would like at least one; perhaps two. At least one for me, please! Can you trop some images? I might be interested in on e PCB too. The power drain is the same as in the original machine or does it comes with low power SMDs? (11-12-2017 10:13 AM)HP-Collection Wrote: Can you trop some images? I might be interested in on e PCB too. Here is a picture of the V1 board. The new version has a few minor changes and I will post pictures soon. I'm curious about the voltage level translators, are thy needed or say 3.3/5 V are everything that is needed by the LCD drivers ? (11-12-2017 07:26 PM)Alejandro Paz(Germany) Wrote: I'm curious about the voltage level translators, are thy needed or say 3.3/5 V are everything that is needed by the LCD drivers ? There is one voltage doubler charge pump on the PCB the provides the supply voltage for the display drivers. The micro controllers are running directly of the battery voltage and the data lines of the display drivers can be driven directly from the port pins. The RCD line needs level shifting, but I have done that very simple by an LED that serves as a zener diode and a pullup resistor. The clock from the display drivers to the µC is connected via a 10k resistor to protect the µC from the higher voltage. All fairly simple hardware wise. The real trick is to properly drive the display driver data lines.